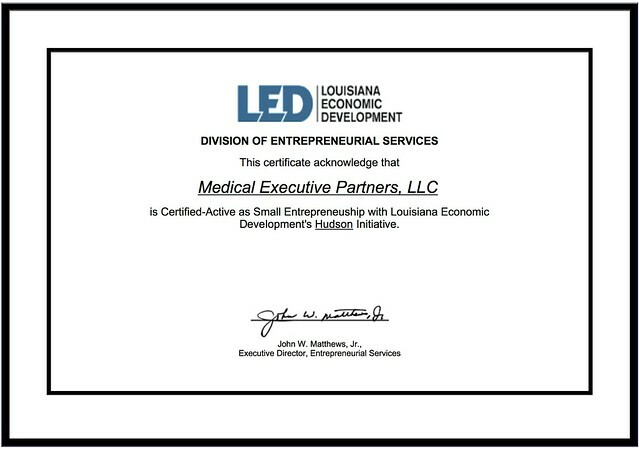 Medical Executive Partners is Small Entrepreneurship Certified by the State of Louisiana office of Louisiana Economic Development. This certificate acknowledges that Medical Executive Partners, LLC is Certified-Active as Small Entrepreneurship with Louisiana Economic Development’s Hudson Initiative. Race and gender neutral, this goal-oriented program encourages state agencies and contractors who receive state contracts to use certified Small Entrepreneurships.